Tonight at Sts Peter and Paul Byzantine Catholic Church, we celebrated the Matins of the Resurrection followed by the Divine Liturgy. In the Byzantine Catholic church, this evening is one of the most significant, both for the celebration of the faith and for the reinforcement of family and culture. Many Byzantine families use this night to reinforce their faith as well as their cultural history. Following the Liturgy, dozens of families gather in the church hall to have their traditional Easter baskets blessed. These baskets do not contain much candy – instead, they contain several food items significant to the Byazntine families’ traditions. Each item in the basket has symbolic meanings relative to the Resurrection. 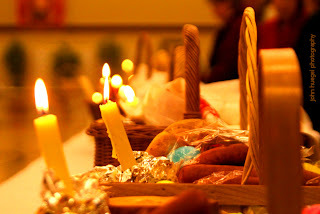 Our basket for example contains: ham, kielbassi, boiled eggs, a butter shaped as a lamb, a spicy mixture of beets and horseradish, a loaf of Pascha bread with a rich cheese center, a small pot of salt, a horseradish root, and a candle. Most other families have similar items in the basket. Some may have a bit of chocolate, a bottle of wine, or some homemade cheese. The foods are simple but each has a special meaning, and each are a rich reward to follow the lenten fast. Our family, along with many in the church, spend time during the week before Easter to prepare these items. After the baskets are blessed following the Resurrection Matins, we take our blessed basket home and have a late night supper of the items and celebrate fellowship and the beginning of the Easter celebration. This entry was posted in Easter by admin. Bookmark the permalink.